← Wedding Talk: The most expensive hanger I ever bought! The Eagle, Globe & Anchor is just a GORGEOUS medal. BADASS. Definitely a change from most round and square medals we get. Definitely beats my Chicago Marathon medal… And I couldn’t freaking wait, to have it displayed smack in the middle of my medal holder! And right then I knew I wanted that medal. I didn’t think I would ever get it, seeing I was far from considering running a full, but I wanted one nonetheless. This year would be the year I’d finally get one to take home! And now, not so much. I’m seriously reconsidering if I even want to do this now. I know, a lot of people could care less about their medals, but for me, it’s all I have to show for my efforts. I don’t usually wear the race shirts, since I tend to prefer sleeveless shirts in the summer (and in the fall, the long sleeve shirts makes their debut), plus the MCM provides only men sized long sleeved cotton shirts anyway. I don’t get a runners body, and still have a couch potato looking one. I don’t get to be fast. So all I really get is a medal, that now I even have a spot on my wall for! 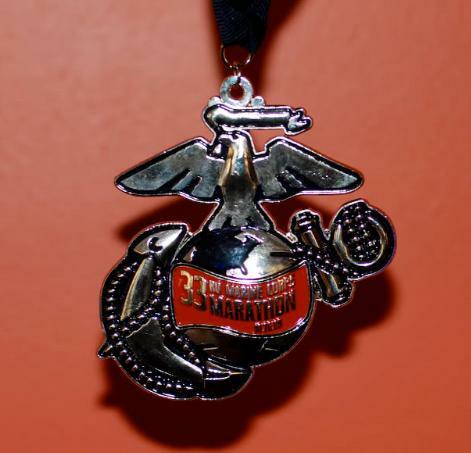 To know that my coolest medal will still be one of my half marathon ones, is a disappointment. I have to admit, this is a major disappointment. After running last year’s MCM 10K and seeing the quality medal MCM gave, I vowed there and then to run it this year. 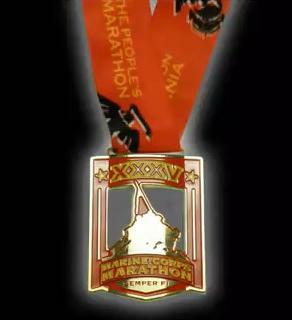 The funniest thing is that MCM’s was voted top marathon medal a few months ago. Why change, then? That said, good luck on Sunday! I didn’t even know they were voted top marathon medal. Even more stupid to change it then. Really frustrating that now we’re just getting an “eh” medal. Ugh… I’m so with you on this one… I wanted to sign up next year, but I want the good medal back (btw, do you know when registration opens for the following year???). Registration for this year’s opened on April 7th, so it should be around the same time. It sold out in less than a week, so make sure to register early! I want the good medal too!!! Bummer! I would totally want the eagle, globe and anchor. Hopfully they get lots of feedback and bring back the ega. Either way, I like this medal too, but I understand your disappointment. 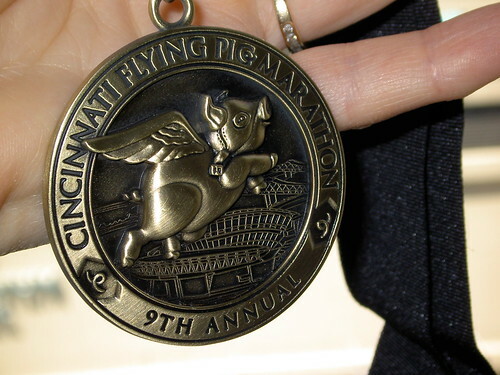 Look at the Cincinnati Flying Pig finishers medal.